Tzatziki, a yogurt sauce made with lemon juice, dill, and a few other ingredients, is a fantastic side to a variety of dishes, including zucchini fritters, curry fried rice and hummus, especially when paired with pita bread. It also goes very well as a compliment to zhug (a hot sauce made of cilantro, peppers and lemon/lime juice) creating what for me is the ultimate quadfecta in pita and falafel sides: zhug, Tzatziki, hummus and tabbouleh. 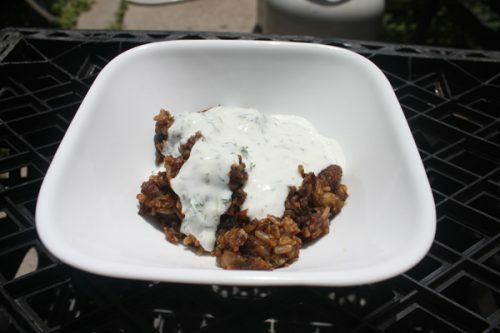 Tzatziki poured over curry fried rice makes an easy and delicious meal. All this is missing is some zhug. There are a couple of things to consider when making tzatziki, aside from how to spell it. The first is what kind of yogurt to use. I use full-fat plain yogurt or, if I’m going through a DIY phase, I use yogurt I’ve made from whole milk. Plain full-fat yogurt is superior (in my opinion) to the more popular and prevalent fat-free and 99 percent fat free options because it has less sugar. Yogurt makers add sugar to make up for the taste of the lost fat. Naturally occurring fat is a lot more healthy than artificially added sugar. Less sugar, less problems. 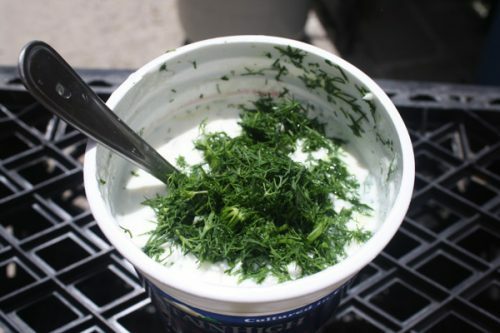 Dill piles up in a container of yogurt being used to mix the tzatziki. Second, good dill, which can be surprisingly hard to find. When I find it, I buy a large bunch. You can also add some chopped mint to the batch, if you’re feeling a little adventerous or have mint on hand. If I have it, I add it. If I don’t have any available, then it doesn’t go in. Tzatziki is more like art than science. The amount of lemon juice used, of dill, of lime juice, of salt, of garlic, everything is up for interpretation. 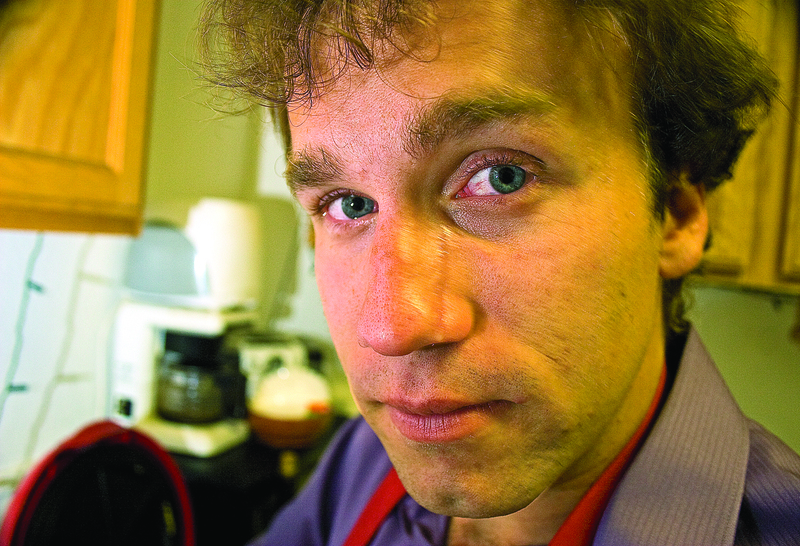 For just the recipe, see the page here, or see it after the jump (more link). If thicker tzatziki is desired, either buy “Greek” yogurt or strain regular yogurt by placing a cheesecloth in a strainer, and the strainer in a bowl, and pouring the unstrained yogurt into the cheesecloth lining. Cover and let sit in the refrigerator overnight or for 8 hours. Chop garlic, dill and, it if is being used, mint. Mix yogurt in a medium bowl with all of the ingredients except for salt, until will combined. Salt to taste immediately and use or refrigerate for 8+ hours and then salt to taste.